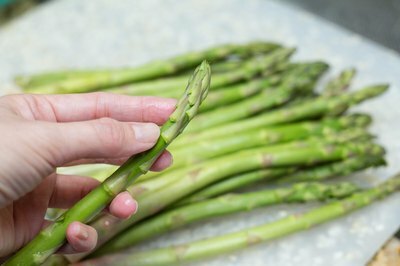 Because the tough outer skin benefits greatly from the softening effects of heat, asparagus most commonly comes to table cooked. 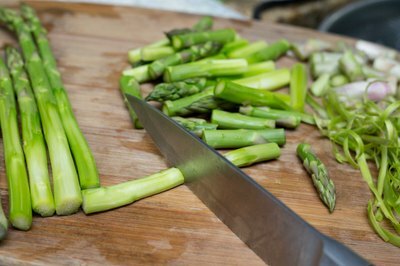 But unlike potatoes or artichokes, you can still easily digest raw asparagus. Keys to serving this variation include choosing fresh and tender stalks, and getting rid of that tough outer layer. All varieties of asparagus can be eaten raw, so let your overall menu or availability dictate the color or colors you choose -- you may be able to find white or purple, as well as green. The thickness of the stalks has no bearing on how tender it is; that depends solely upon the vegetable’s maturity when harvested. Check that the flower end is tightly closed. Check along the length of the stem for uniform color, without fades or streaks. Withered or overly limp stems can indicate that the asparagus has passed its peak of freshness, as can a stem end that appears dried out. Rinse the asparagus thoroughly in cool water. Either shake off the excess water or blot the spears dry with paper towels or a clean, lint-free kitchen towel. Slice off ¼ inch or so of the stem end. The flower end is tender and crisp no matter how thick the stalk is, so cut those off as well. Peel the remaining stalk lengthwise to remove the tough and fibrous skin. Cut thin stalks into bite-sized pieces or leave them long as you prefer. Slice thicker stalks lengthwise with a very sharp paring knife, a vegetable peeler or mandoline, keeping the thickness as uniform as possible. Any seasoning that complements cooked asparagus also works well with raw. The classic accompaniments are lemon juice and pepper. Shaved Parmesan adds a deep, savory note that brings out the earthiness in asparagus. 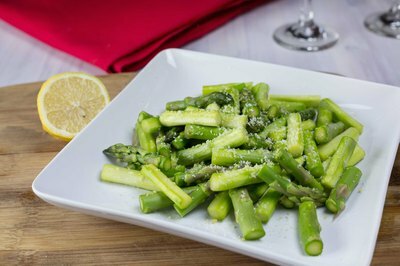 Toss raw asparagus with a dressing made of olive oil, lime juice, garlic salt, chili powder, cumin and thyme for a Southwestern treat. 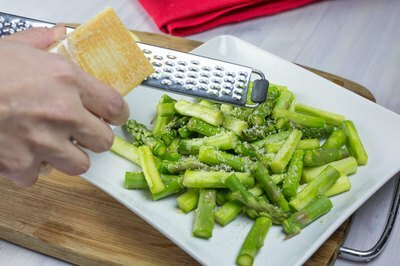 Add raw asparagus to cold pasta salads for an unexpected bit of crunch, or serve thin or slivered spears as a side dish with cold chicken or fish. A member of the lily family, asparagus also keeps fresh by storing as you would any flower with a cut stem. 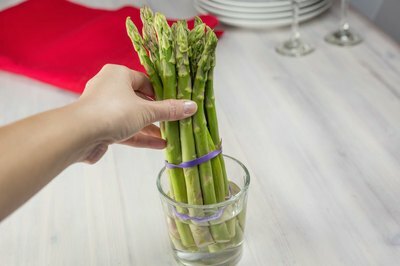 Trim the ends of the stalks and place the asparagus spears in a glass tall enough to support the stalks. Fill the bottom inch or two of the glass with water. Place a plastic bag loosely over the top of the stalks and keep them in the refrigerator. This keeps your asparagus gorgeously crisp and fresh for up to three days.